A film screening and discussion examine the plight of Palestinian refugees in Lebanon. After the screening, a panel of experts shed light on the challenges facing Palestinians. When Ann Dismorr, recently appointed director of the United National Relief Works Agency’s (UNRWA), arrived in Lebanon less than a year ago, she was told by officials that now was not a “good time” to lobby for Palestinians’ rights due to the situation in Syria and the upcoming parliamentary elections. She didn’t listen to them. 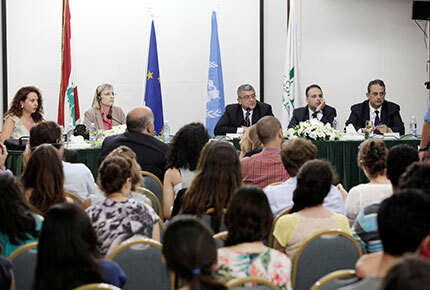 UNRWA, in partnership with LAU-MEPI Tomorrow’s Leadership Program and the Social Sciences Department, hosted a screening and discussion on May 24 on the Byblos campus called “Dignity for All”. It unveiled some of the plaguing problems facing Palestinians in Lebanon and laid out ways to tackle them. The presentation opened with a screening of Someone Like Me, a poignant documentary about a Palestinian boy living in Bourj el-Barajneh Camp, and the obstacles he faces trying to study, find work and fight stereotypes among Lebanese. Under the guidance of the University Enterprise Office, 20 LAU-MEPI TL students recently visited the same camp. “Second hand impressions are not sufficient,” said Dismorr, who encouraged audience members who hadn’t seen a camp to do so. There are approximately 422,000 Palestinian refugees in Lebanon, half of whom live in the country’s 12 official refugee camps, where conditions are deplorable. Due to their legal status in the country, they cannot travel, own property and are banned from working in most high-level professions. After the screening, a panel of experts shed light on the challenges facing Palestinians. Though a labor law giving them the right to work was passed in 2010, it was watered down and did little to open up many professions that are still closed off to them said Dr. Ziad el Sayegh, member of the Lebanese-Palestinian Dialogue. He says their problem is not a humanitarian, but a political one, and that Lebanese may have sympathy for their plight, but do not want them to settle in Lebanon. Laswi says there should be more awareness on campus about the situation of Palestinians in Lebanon. “Their right to work is so essential. If they can’t produce money, they can’t live,” she added. The war in Syria has compounded the difficulties for Palestinians as some 55,000 Syrian Palestinians have been flooding into the country and are taking shelter in the already over-crowded camps.